…when you realize that life is a bed of roses. It’s all gotta do with BF. Sometimes, he simply ruins my routine….goes out of the way and does something which makes me realize how very lucky I am!! BF happens to be one of those guys who are always at a loss of words…..the kinds who cant say in words what they feel. So he resorts to doing small things/favours. 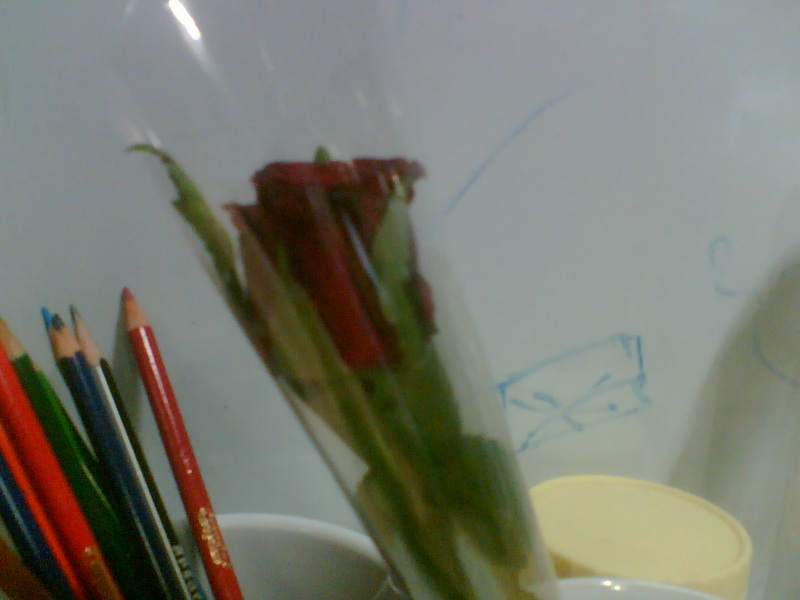 A few days back, out of the blue, he came home with a red rose for me. 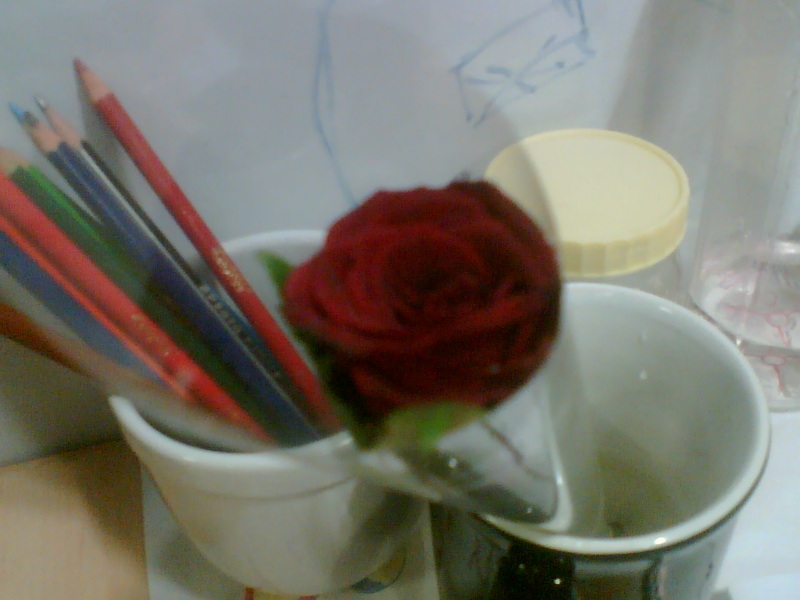 So recently , he got this rose….and me got all mushy about it (of course). After hugs&kisses I went back to my cooking. BF was in the bedroom, searching for something on the net. Shortly , he calls me in to listen to something. It was the song “Aaj din Chadiya…” from “love aaj kal”. I’d heard the song before and hadnt payed much attention to it . But BF played the song and asked me to listen carefully. And you know what?? Being held close, with his arms around me…listening to a lovely romantic number….interspersed with soft kisses on my head (BF is atleast a foot taller than me !! )….was such a lovely experience that I know my words here barely do any justice to it !! After having the twins, our lives got so busy that we rarely got time for each other….and these rare moments of togetherness, closeness, of love are so precious to me…I think it’ll forever be etched in my mind….coz I experience them when I was actually craving for it…but was sadly unaware. PS: I found the snap of the rose in my cellphone.Posting it here. BTW, it was taken a week after BF had given it to me. When staying with your in-laws…. I read an interesting article by Unmana, on advise to wives regarding their in-laws. You can read the complete article here. 1) Accept them. The sooner you learn to accept the fact that these people are “family”, the easier it gets for you. Remember, the in-laws are equally apprehensive of your feelings towards them . You may be a part of their son’s life…but how much of a part do you form in their lives too?? Once you accept them wholeheartedly as family, better are you chances of having your say in homely matters.Trust me on this. 2) Dont critisize anyone in the family for the first one year. This is relevant. Since you are the new entrant to the family, you may not agree with their ways n means of doing things. Just watch and observe. Dont give information like, “this is not how its to be be done. In our place we do it like this…blah blah blah”. However right you may be, remember that they have been following those methods for a very long time. And there’s no reason for them to change their ways just because you say so. Simply observe….avoid going overboard with compliments (you may have to do it the same way next time!!). 3) Relative stock. Very important. Take a stock of thier interactions with their relatives/family-friends. Not all relatives may be on good terms with your in-laws. Avoid getting cozy with people who tend to backstab your in-laws. Its the surest way for them to seed discord in a family. Remember that however stern/strict/rigid your MIL might seem, she still has the responsibility of keeping the family together…and that includes you. Rather than being her opponent, try and be her ally. Its not as difficult as it seems….but it does take time. If you come across relatives who start saying nasty things about your in-laws, nip them in the bud by saying, “I am sure you are mistaken. I have positive vibes about my MIL/FIL/etc and am sure they feel the same way”. This usually works in shutting them up. 4) Baby blues. Not ready for a baby yet? Talk to your MIL about it. Take her into confidence. Express why exactly you want to have some time. What are your aspirations, what you want to achieve in the meanwhile, etc. Dont be surprised if she doesnt understand your need for delay. But atleast she wont pester you or pass snide remarks. In the rare case that she does (in front of others), you can calmly say, “but Ma, didnt I tell you why I’m delaying?” or “But Ma, you know the reason, dont you?” It works dearies…it works! 5) Rope in your partner. Make your partner aware of what your experiences are . That doesnt necessarily mean that you nag him to no end as to how awful his family is and how bad they treat you. Dont forget, they are “flesh-n-blood” and more dear to him than anything….even you. This also does not mean that you go on gushing about how wonderful they are…..coz once problem strikes, he may have difficulty believing you.Try and see his family with his perspective. Every person has enough goodness in him/her…try and find that. In some rare cases, it may not be visible…but it exists. You just have to know which chord to strike. But yeah, let your husband know your experiences at home. He may be able to help in settling you in. Thats all for now. If I can think of any more nuggests of info….will post them here. Cheers to all till then. I’ve been meaning to let you all know what (or, rather who) made me want to start blogging. I realized the reason i was so addicted to them , was that they were all slices of life. Nothing path-breaking…just another day in their lives. And since there were many days when i had a zillion thoughts running in my head, what better way to rein them in than a blog? Right now, i dont have any readership….am not even expecting any . But yeah, if u ever come across this post…do check out the blogs above. Guess what? I forgot to mention. I had started blogging waaaay back in 2007. Didnt get too far (since i’m a die-hard procastrinator). Not much there…but if u have the time…. For as long as Ican remember, he used to pester me to take down notes on my thoughts (I took it as his escape route to avoid actually hearing me voice them 😀 ). well, BF, if you are reading this….. I dedicate this Blog and all its content to you. Love ya loads ….forever. How does it feel to be roused from sleep…in an awfully violent manner..? While the perpetrators of this crime sit close to your head,staring down at you, waiting for you to open your eyes! RS walks too, but with support, holding onto something…haven’t seen her taking the initiative to walk on her own yet! Sigh!! the day is not far when i’ll be running after these two 🙂 and yeah, then, maybe, i’ll finally start losing this excess weight ! 😀 (Cross my fingers). When the twins were born, i used to spend atleast an hour each night taking down their updates. I used to write in regularly. Somewhere along the way, being sleep-deprived for months…i let go of this beautiful habit. Am ashamed…coz i missed out on the major landmarks in my babie’s development. And now, i’ve taken a chance to undo that error. This blog is mainly my attempt to capture as many baby updates as possible…and also to take down regular snippets from my life….if i feel they are worth mentioning. Will be posting the diary entries shortly (under the heading “Reminiscings….”. How does it feel to work on a task which is totally out of your expertise….? When you know NOTHING about it, yet , are expected to deliver it on time…? Do you feel that awful pressing sensation deep within your chest…? Or the roiling of your intestines….? Am experiencing all these wierd sensations…because i think, no cut that out! I KNOW i cant do it. ?I have no idea where to begin…! just thrashing about in the wild (read : Googling) will take up loads of time. Should i refuse to take this responsibilty (I’ve already done that once before 😦 ) ? Should i take it up and do a shoddy job of it? Am at my wit’s end!! An to top it all….I waste time in blogging abt it! UGH! When will i learn?!! !